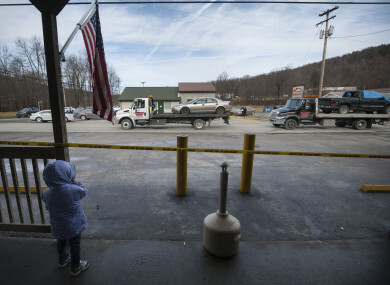 A little girl watches from the front of G&D Market as trucks remove three vehicles from the scene. State police said Timothy Smith, 28, was armed with a semi-automatic rifle, a .308-caliber rifle and a handgun and was wearing a body armour carrier without the ballistic panels inserted when he opened fire early yesterday morning at Ed’s Car Wash in Saltlick Township, a rural town about 89 kilometres southeast of Pittsburgh. Smith was on life support yesterday and not expected to survive after suffering a gunshot wound to his head. State police said it was possible that the gunshot wound was self-inflicted. Authorities would not reveal how Smith knew the victims, but Chelsie Cline’s half-sister, Sierra Kolarik, told the Pittsburgh Tribune-Review that Smith had developed an obsession with Cline. Porterfield said that she was told by family members of other victims that her husband and Cline had spent the past two days together after Cline ended a relationship with Smith. Porterfield said that she and her husband – who were married in November – had been “having some troubles” this month. Cayleigh Myers said she was friends with Seth Cline, Chelsie Cline’s half-sibling, and described the construction worker as “very outgoing, very funny and very smart”. Ed Bukovac, who owns the car wash, told the Pittsburgh Tribune-Review that a neighbour called him around 4am yesterday and said something was wrong at his business. Bukovac said police were on the scene by the time he arrived and that he had few other details about what happened. Email “US car wash shooting: Victims families say killer was motivated by 'jealousy'”. Feedback on “US car wash shooting: Victims families say killer was motivated by 'jealousy'”.